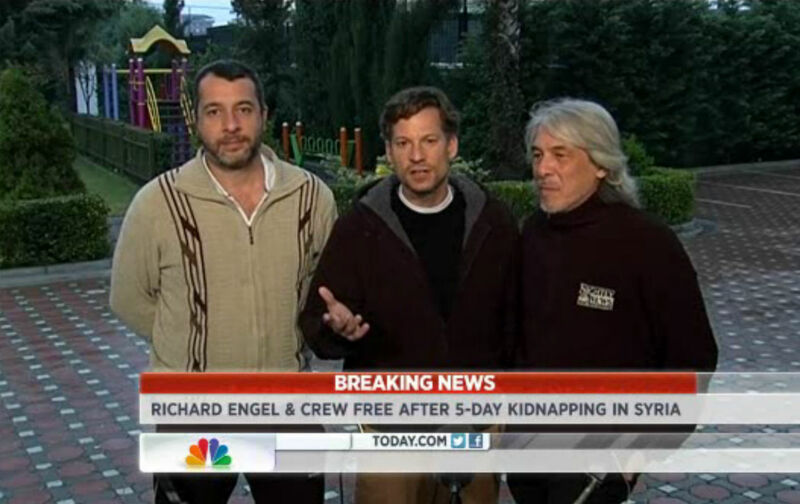 Not correcting the story of Richard Engel’s kidnapping is worse than the Brian Williams scandal. An NBC News journalist is involved in a harrowing scene of battlefield danger. The journalist’s first-person story serves as the dominant narrative for years—but it turns out to be wrong, very wrong. Sound familiar? This isn’t the Brian Williams scandal. It’s worse: the story of the December 2012 kidnapping and rescue of Richard Engel, NBC’s chief foreign correspondent, in Syria. The prevailing narrative held that, as Engel reported immediately after he was freed, a group of Shia militiamen loyal to Basher Assad’s embattled government had kidnapped and mistreated the star reporter and his colleagues. Engel pointed to the language his captors used and other pronounced signs of their allegiances, ranging from graffiti scrawled on the wall of their prison to the coffee cups they drank from. Far from answering all the questions about the episode, Engel’s update piece did not give a full accounting of the story from NBC’s perspective. Those gaps were filled, in part, by a subsequent report in The New York Times. The resulting picture looks very bad for NBC, in many ways worse than Brian Williams’s fall from grace due to self-aggrandizement of his now-infamous helicopter incident in Iraq. This was war propaganda spread by NBC, a respected institution in American news. And if the Times’s account is to be believed, the network let the false story stand for years knowing full well that it was at least questionable, if not entirely false. Why is this so much more serious than the Brian Williams scandal? At stake in l’affaire Williams was merely the reputation of a veteran journalist—Williams himself—and not decisions of war and peace for the United States. In the Engel saga, the aim of the rebels who kidnapped his crew clearly became to demonize the Assad regime (an aim, it bears mentioning, whose realization hardly requires spreading falsehoods) with the goal of goading the West into military intervention against Assad.